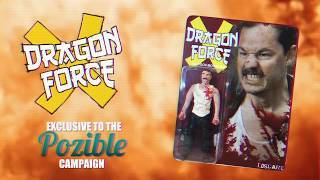 Following in the footsteps of such nostalgic fan pleasers as DANGER 5, KUNG FURY, STRANGER THINGS and HOBO WITH A SHOTGUN, DRAGON FORCE X is an adrenaline-fuelled, serialised, adventure series made by and-for fans of ’80s TV and cinema. We hope you enjoyed DRAGON FORCE X’s exclusive run on Cult of Monster throughout 2017/18. Maddox Montana, killer for hire, finds himself in hot water in Bombay. Maddox is offered a job he can’t resist. Maddox arrives in the South Island of New Zealand to search for General Saunders but not everything goes to plan. Having fallen into the evil clutches of General Saunders, Maddox receives help from the most unlikely of places. Maddox and Nim Nim go head-to-head with General Saunders in this gruelling showdown of masochistic proportions! Who will win? Continuing on their New Zealand adventure, Maddox and Nim Nim’s friendship blossoms as they come across the mysterious witch, Atumai! On their quest for the Golden Key, Maddox & Nim Nim stumble across the witches of the cursed forest! Maddox & Nim Nim may have found the lair of Brutus Maximus but to find the key they will come up against their greatest challenge yet! As the battle rages on with mythical gargantuan Brutus Maximus, Maddox & Nim Nim must summon everything in their power to win including conjuring the much fabled Dragon Force!